There are tons of great community contributed projects on Force.com Code Share! 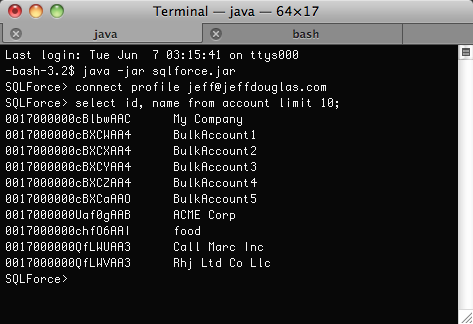 I was browsing last week and ran across SQLForce, a command line scriptable tool that provides ANSI like SOQL DELETE, INSERT, UPDATE, SELECT/DISTINCT, and SELECT/UNION commands. The project has been out for a year but I've never heard anyone talk about it so I decided to give it a whirl. After using SQLForce for about week now I'm in love with it. Here's a brief video of it's features. The install is absolutely painless so give it a try.